We are honored to announce that our firm’s founder and managing partner Greg Coleman has been recognized as the 2018 Knoxville Product Liability - Plaintiffs “Lawyer of the Year” by The Best Lawyers in America©. This marks the second time Coleman has been awarded this honor by his peers in the legal community for his outstanding accomplishments in the practice area of product liability. He was previously named the Knoxville Product Liability Litigation - Plaintiffs “Lawyer of the Year” in 2016. What is the “Lawyer of the Year” Award? The Best Lawyers in America “Lawyer of the Year” award is presented to one attorney in each practice area and community per year. Candidates who are considered for this prestigious award are attorneys who are held in high esteem within their area of practice and local community. Nomination: Candidates can be nominated by any member of their local legal community except for themselves. Peer review: Attorneys who are currently recognized by Best Lawyers provide feedback on the degree of the candidates’ work. Analysis of feedback: Best Lawyers collects the poll’s results and reviews the voters’ feedback. Eligibility check: Best Lawyers confirms if the candidate is in good standing with his or her local bar association. Results released: Best Lawyers informs the law firm of the results and publishes the newly recognized attorneys in print and online features. 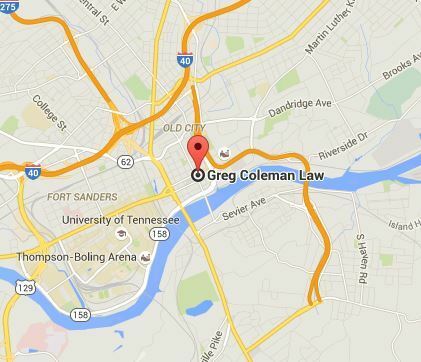 The Knoxville personal injury attorneys at Greg Coleman Law congratulate Greg Coleman for being awarded “Lawyer of the Year” in recognition for the important work he contributes to the areas of personal injury and products liability litigation.